Easily adjust your keyboard and mouse to your correct ergonomic position and work in comfort with the help of a 3M sit and stand adjustable keyboard tray. Lever-free lift and lock mechanism enables easy height adjustment. And the unique sit/stand feature allows for more variation in work positions, helping to reduce the chance for repetitive stress injuries. Compatible with ergonomic keyboards. For corner workstations or straight-on workstations that accept a 23" track. Lifetime warranty. Super adjustable separate mousing platform mounts left or right and needs no tools to adjust. Platform slides left and right over the keyboard, tilts forward and backward and adjusts up and down to the same level as the keyboard platform. Features 3M¢â Precise¢â Optical Mousing Surface. 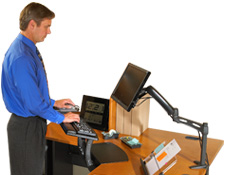 Adjustable Keyboard Tray offers unique sit-stand arm that raises platform up to 10" above the mounting surface and tilts +15 degrees/-15 degrees. Lever-free arm is easy to adjust. Adjustable keyboard platform with patented left/right sliding for optimal positioning. Highly adjustable mouse platform mounts left or right and easily adjusts up, down, forward and back. Gel wrist rests feature easy to clean leatherette cover with antimicrobial protection. 23" track length is ideal for corner workstations with less than a 12" radius or less than a 17" diagonal. Not compatible with shallow workstations.